area waterways from backyard dock. bakery, dollar store, McDonald's, Subway and pizza less than a mile away. size sofa-bed in ground floor living area). Separate entrance and third floor deck with patio furniture. No smoking permitted. No pets allowed. This house has been in our family since 1999 when Jane's parent's purchased it to use as a rental property. Although from the Hudson Valley of New York the family has vacationed on the Delmarva Peninsula for years. Because of our longstanding interest in the area Jane's in-laws started renting properties here too, and now a contingent of over twenty cousins, siblings and other family and friends convene once a year. One sister-in-law has had Pasta Night followed by board games and cards games at her nearby rental for over 25 years. And trivia night, Mexican night and more continue to be family traditions for us all. The house is our center of fun and we welcome and encourage others to use it similarly to strengthen the bonds of family. My two rules for this house are that I must go to the beach every day, and I must play the piano every day. This house is so comfortable to be in with its breezy atmosphere and multiple porches. There is a nook for everyone to enjoy. It is a great house for families and for kids. The canal is tough to beat with the opportunities for crabbing, fishing and launching of a small craft. It is a pleasure to simply sit out there and read a book. The screen-in porch gets the most attention it seems since it overlooks the canal and draws folks for breakfast, lunch, dinner, reading, games, crafts, you name it. It is a lovely spot to sit. That porch swing downstairs is pretty terrific also. And besides the pleasure of the bay and the quiet community we can just as easily walk to the ocean and enjoy the thrill of the beach and the water. We get the best of both worlds at this house. We are a twelve minute walk to the beach and a five minute car ride. Bethany Beach is free to use all year round. Can hear the waves crashing from the house although we cannot see the ocean directly. Approximately 0.4 mile walk to the Atlantic Ocean. 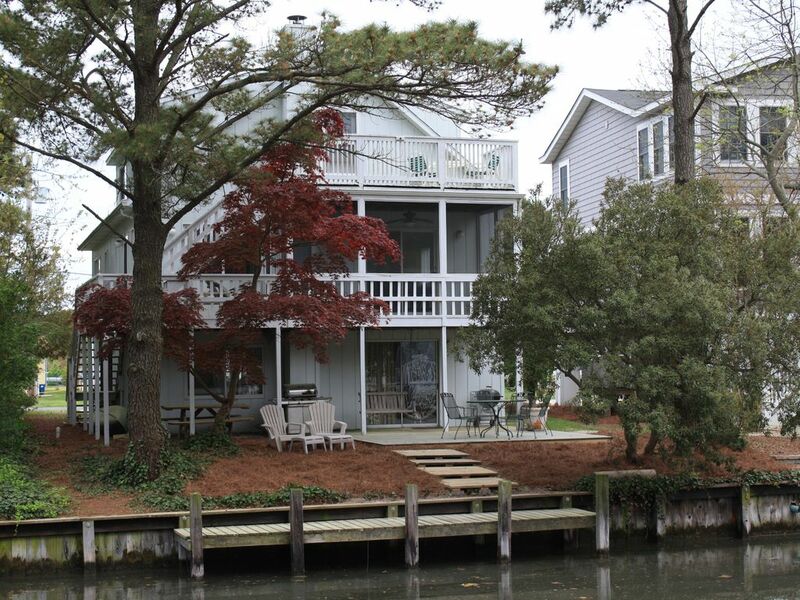 Located directly on one of the Assawoman Bay canals behind the house, & across the street in the front we see the next canal over out our windows. We are between two canals we can easily access. Central air conditioning provided by two units. Adult bicycles Backyard dock access for your kayak and canoe, or from local outfitter. We have an audio sound system for a mobile device. On-demand music stations through digital cable service. Console piano with music books and sheet music. Dock - backyard access to canal for light watercraft such as kayak or canoe of your own, or rented from local outfitter; enjoy bay or Assawoman Canal where local birds abound (osprey; egrets,herons). Ground floor has outdoor shower, large family room with sofabed, television, computer, piano, desk, laundry, but no other bathroom facilities. We had a great time staying the The Canal House. There was plenty of room for the family ( 7 all together). The house is well stocked with dishes, cups, pots, pans, books & games. The brand new kitchen appliances are a nice addition. We enjoyed the eclectic combination of furnishings & décor. Thank goodness for the central a/c as it was very hot during our time there. We added 2 jigsaw puzzles to the collection! My 2 year old grandson loved the Arcades & Funland amusement park rides on the Rehoboth Beach Boardwalk. Our first rental experience was certainly a positive one! Thank you! Thank you for your feedback. And thank you for adding to our puzzle collection. We've had more fun with family and friends doing puzzles at the house because it's a group activity we never make time for anywhere else. So glad you had a good time and appreciated our house. Please come again any time. We'd love to have you. Upon first entering house, was a bit disappointed that the house was outdated. However, it soon became very cozy and comfortable for our two families who were vacationing together. Positives: Roomy with plenty of space for 4 adults and 6 kids (ages 12-20). Loved being able to put the kayaks and boat directly in canal in front of house and the kids enjoyed going out nightly to check crab pots. The community was quiet and friendly. Enjoyed local restaurants and boardwalk. Close to everything at the beach! Great place to walk/bike. The beach was within walking distance, but found it was easier to drive/bike to the beach instead to carry all our beach stuff. Finally, the house was well stocked with everything we needed for our comfort and convenience. Also, the Air Conditioner worked great! Negative: The house was outdated and could use a good cosmetic overhaul. The beds were not very comfortable and quiet squeaky, particularly in the large kid's room. Overall though we were quiet happy with the house and surroundings! Not fancy..but certainly comfortable as beach homes should be. :) PS: Wear water shoes to the beach. Locks of rocks when swimming. Thanks for your hospitality and would stay at this house again. We appreciate our renters feedback so we can make our house as comfortable as possible so thank you for taking a moment to write. Our canal-front location, but also so near the ocean, is indeed an attractive attribute of this house. And we do try to leave all the typical household items in place so when you go to look for birthday candles, a bucket, or Scotch tape you just might find them. We try to be responsive to our guests' feedback so we have changed the box springs in the kid's bedroom to newer, much quieter ones. So glad you were able to take full advantage of our place by boating on the canal and heading to the beachfront. We'd love to see you back again. House was great Had everything we needed. Enjoyed relaxing by the canal. So glad you had a good time at Canal House. Being close to the canal is a bonus when vacationing at the beach. We love to sit on the screened porch and have our meals, watching the wildlife (and humans) pass by on the water. We wish the Army Corps of Engineers could have scheduled their beach renewal project for the off-season, but this is when they were able to do it. Replenishing beach sand after winter storms is an important part of addressing beach erosion and we are lucky to have the help in maintaining our play areas. This year it sounds like it fell during your vacation time rather than being invisible to our guests as usual. A South Bethany Beach vacation is the tradition of our extended family who all rent homes the same week. The spacious and well-equipped Canal House has been the headquarters for my immediate family for many years, first staying there when our sons were teens. Now that they are grown with lives of their own, they still look forward to this special week. Between trips to the beach, or hiking, or boating, our boys gather cousins and friends together for game nights. We enjoy family meals together. One year, we even hosted a family wedding. The screened in porch and deck are favorite places for getting lost in a good book. It is the ideal place to connect with friends and family, and regroup and reflect. You have discovered the best parts of staying at Canal House - the screened in porch and the many gathering spaces! We try to stock the house with as many family friendly activities as we can including games and puzzles, the piano with music, bikes and beach toys, chairs and umbrellas, a garage workbench and even crabbing cages, to help encourage a good time. The place is perfect for families and especially extended families who want to enjoy the beach but have access to so much more, as well as spend time together. So glad you continue to return to Canal House and take advantage of all there is to do there. We don't let issues with our lodging ruin our vacation, so we had a great vacation. However, I CANNOT recommend this house due to the strong smell -- particularly in the basement and other major issues. Here's a list of pros / cons. Read on for the full story. When we arrived, we notified the manager - Phyllis of three issues - 1) The strong musty / off smell in the house. 2) The twin beds were extremely loud and creaky - when the kids rolled over during the first night - I could hear it in the bedroom across the hall - and it sounded like someone was dragging a kayak through stones. I mean, I'd never heard a bed make that noise. 3) Three of the 5 ceiling fans did not work - including the one on the screened porch. Phyllis and her husband were incredibly responsive and came over almost immediately. They fixed the fans, checked out the beds and acknowledged the problem and identified that the issue was the box springs. She also acknowledged the smell was an issue. Later, she let us know that the OWNER informed her that the smell was creosote (look it up) and there was nothing to be done about it. She told us also that the beds were something that would be addressed, but not during our stay (?!?!). We took action on the beds - removed the box springs out of the beds and leaned them against the wall. There were just enough slats on bed frame to hold up the mattresses. Problem solved. We had some lovely days in the 70s, so tried to open up the windows to air out the house a little, but very few of the windows had screens in them, so leaving the windows open was not really an option, which is unfortunate in a beach house with such a nice breeze. We appreciate hearing about the experiences of our renters so thank you for taking the time to comment. Your description of the problematic sound of the beds is so vivid I could practically hear it across this website. We have since put in new box springs on both the twin beds so that problem is solved. Thank you for pointing it out so clearly. We all had a great time here! There is lots of room to hangout, both inside and out. Nice screened porch was great to spend time in. Owner is very responsive to questions. Kitchen is very well stocked. So glad you had a good time at Canal House. We love that screened-in porch too, and eat as many meals there as possible so we can overlook the canal with its wildlife and weather, and also breathe in the sea air. You were great guests and we welcome you back anytime. Beach, swimming, biking, boating, jogging, crabbing.